Originally made by the Gray's, this artisan cheese is now made by the Horrell's of Lynher Valley Dairy. It is a cow's milk, hard, full fat, vegetarian cheese. Light and creamy this is a mould-ripened cheese with a good bite that is wrapped in nettles. About the producer: Cornish Yarg comes from the Lynher Dairy at Netherton Farm, Upton Cross. This farm is part of the Duchy of Cornwall Estate and has always been a dairy. The Horrells have lived here since the ‘60’s. Cornish Yarg was invented by Welsh cheese makers, Mr. and Mrs. Gray, 15 years ago based on a 13th Century recipe. The name itself is their name spelt backward. Mike Horrell bought the recipe from the Grays on the suggestion of the Duchy of Cornwall Estate to add value to their milk by making cheese. Mike uses pasteurized milk from his Friesians grazing on the land bordering the "Cheese Ring” high on the Cornish Moors. The curds are cut, turned, cut and turned again until the acidity level is good, then they are milled, lightly pressed overnight, and brined for a few hours. Then, the cheese is coated in nettle leaves. 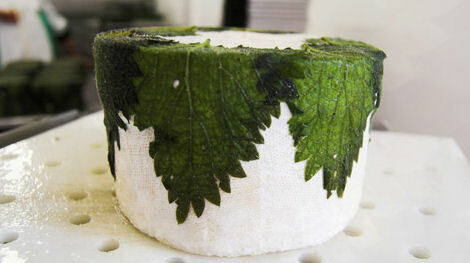 The leaves are edible and have been used to maintain the moisture in the cheese and would have been used for the purpose (in the past) of keeping the flies away. In 2 weeks the nettle coating turns a spidery gray, in 4-6 weeks Cornish Yarg mellows out and gives off a grassy, honey-like, slightly citrusy flavor. Cornish Yarg is aged for about 2 months and possesses a moist, supple texture and a fresh, clean, creamy, tangy flavor.